Root canal treatment (endodontic treatment) is a dental procedure that replaces damaged pulp (inside the tooth’s canal) with a filling. Inside the tooth underneath the enamel and dentine lies the pulp, a sensitive tissue composed of blood vessels and nerves that provides nutrients to each tooth. The root canal is the hollow part in the centre of the tooth which encases the pulp as it extends through the roots of the tooth and into surrounding bones. Root canal treatment addresses the damaged nerves within the tooth to relieve dental pain whilst also saving your teeth. A fully developed tooth can survive without the pulp because the tooth can continue to be nourished by the surrounding tissues. Patients typically require a root canal treatment when inflammation or infection is identified in the roots of the tooth. 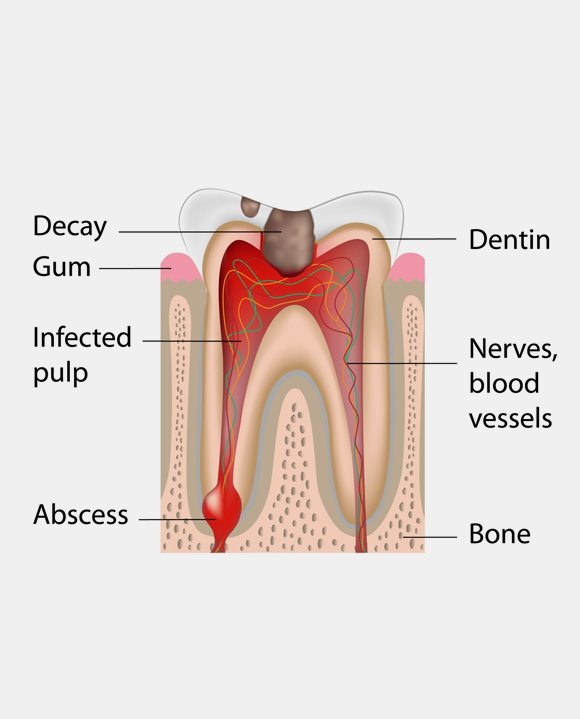 This infection can be caused by numerous factors including deep decay, large fillings, trauma, and advanced gum disease. This treatment involves two or more appointments to remove the diseased nerve, medicate, fill and seal the root canal. It is best to complete this treatment in the early stages of diagnosis to decrease the bacteria leaking to surrounding areas. Note: If your root canal was infected to start with, our dentist will prescribe you with antibiotics to reduce the inflammation and kill some of the bacteria. It is important for you to take the full course of antibiotics to ensure the antibiotics kill off the bacteria. Signs and symptoms that you may need root canal therapyinclude pain and increased sensitivity, abscess (infection) causing build-up of pus within the root canal, or a deep cavity decay that extends to the pulp, causing the pulp to become infected with bacteria. To address these complications your dentist or endodontist will therefore perform root canal treatment and complete restoration of the tooth following the treatment. Saving the natural tooth with root canal treatment will also ensure efficient chewing (the tooth remains in the same location and shape), normal biting force and sensation is achieved (the “height” of the filling can be filed for comfort), the natural, aesthetic appearance of your tooth will be maintained as the tooth will be the same colour, and your teeth will be protected from excessive wear or strain (which can lead to more complex complications). Therefore, it is highly recommended for you to visit your dentist bi-annually to monitor the growth of your mouth and diagnose complications that need to be treated. 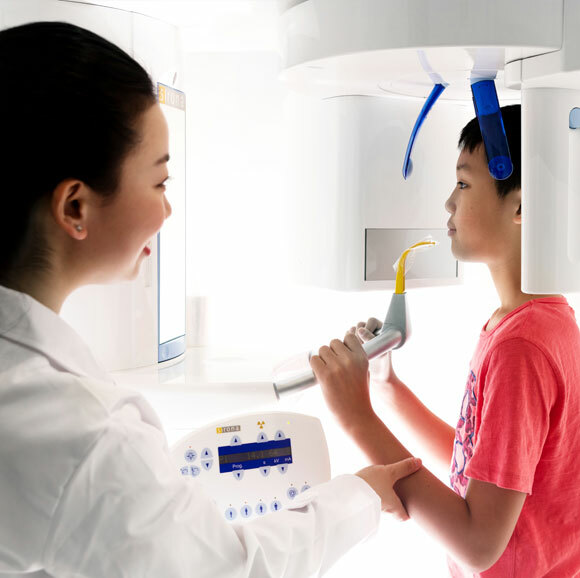 To verify the extent of the bacterial infection, your 360° dentist will conduct x-rays, using panoramic x-ray (x-ray of the entire set of teeth) to determine infected individual teeth and bite-using x-rays (x-rays that highlight the crowns of the back teeth) to determine the extent of the infection. This allows your dentist to see what is happening below the surface and determine the problem and severity and the individual tooth or teeth that need to be managed. Appointment -depending on the severity of the case, your dentist will decide if your treatments will be completed in one or two or more appointments of approximately 90 minutes each. Prior to beginning root canal treatment, your dentist will numb the tooth to ensure the patient is comfortable. An opening is then made at the top of the tooth until the underlying pulp is exposed. The pulp is then removed from the root canal through various sized files and cleaned with a disinfecting solution. Additional x-rays will be taken to ensure the files reach the end of the root and that no pulp is left behind. If the treatment is completed in two appointments, the dentist will treat the canals with medicine to kill the bacteria and fix a temporary filling to seal the opening of the tooth/teeth. However, if the treatment is to be completed in one appointment, the dentist will proceed to filling the root canal. The tooth is numbed again, a rubber dam is placed to stop the flow of saliva to the root area. If the treatment is separated into two appointments, the dentist will remove the temporary filling. Once the root canal is completely dry and clean, a rubber compound(gutta percha) and a sealer paste are used to fill the root canal and finish the procedure. Any major pain or sensitivity should subside within the following two days of treatment. Once the anaesthesia wears off, you may feel sensitive or sore around the tooth where the infection may have been located prior to surgery. A mild throbbing sensation and discomfort may also be felt. These symptoms can be alleviated with over the counter pain relievers. Be mindful that the area around the root canal site will be more sensitive than usual after the procedure. To minimise the discomfort and the risk of damaging the tooth, do not bite on the treated tooth until it has recovered. Avoid hard, sticky and hot foods after the root canal procedure which will cause pain when consumed. Following your treatment, it is also important to not eat until the numbness has worn off to prevent you from biting your tongue and soft tissues. Even though your dentist has treated and removed the infection from the damaged tooth, it is crucial to follow proper oral hygiene habits to prevent the formation of decay and infection. This means you still need to brush twice daily, using a fluoride-based toothpaste whilst brushing for at least two minutes. Flossing in between your teeth to remove any built-up food in the gaps as well as removing the plaque deposits that may collect throughout the day. Lastly, a cavity-preventing mouthwash should be used to kill any additional bacteria that were not washed off during the brush and floss. Our dentists may also advise you to opt for a permanent filling and a crown cap on top of the tooth that required root canal treatment. This permanent filling will ensure the root canal is sealed off to an opening that will not allow bacteria to grow. Final restoration includes placing a dental crown on an endodontically treated molar to completely seal off the tooth. It is highly recommended that teeth with large fillings, extensive decay or fractures which have received root canal treatment be restored with a crown. This permanent restoration is to secure and provide adequate protection and strengthening for the tooth. Hence, when root canal treatment is paired with a permanent filling and crown restoration, the risk for recontamination is significantly decreased ultimately saving your tooth. For more information on root canal treatment and the post treatment options, make an appointment with us on 02 9051 2828 today.